My Italian friend, Paola, sent me this photo from Simione in Northern Italy. 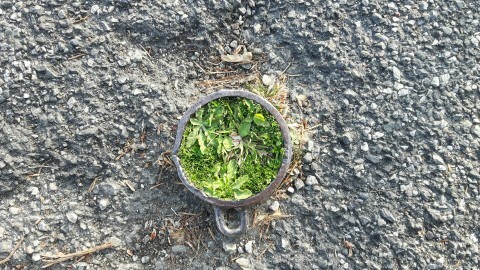 This exquisite little garden has formed in a metal ring used for inserting parking prevention posts. I love the microcosm created from at least four different plants, from little seeds drifting on the wind, landing on a scrap of soil. Weeds are the greatest pioneers and even in the cracks of pavements they can give us hope- little green creatures full of innocent determination.